This site is dedicated to our little girl, Hope Elisabeth, who was born with Trisomy 18, a chromosomal abnormality. She passed away shortly after she was born. We miss her and desire to share her story with others. You can find links to her story on the sidebar. Please take a look! Hope Elisabeth Wessman was born on May 14, 2005. Prior to her birth, Hope was diagnosed with the chromosomal disorder Trisomy 18. We knew that her time with us would be limited and felt so blessed to spend a day with her. She is a beautiful little girl with lots of dark hair. We are grateful for the memories created with her and look forward to being reunited as an eternal family. 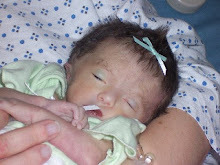 Seven and a half years following Hope's birth, her sister, Amelia "Milli", was also born with Trisomy 18. Milli has her own website at www.ameliawessman.net. This is a fabulous organization. We knew the co-founder at the time of Hope's birth. She, along with so many others in our community, was a great support. The services of Angel Watch are available to anyone in the state of Utah - regardless of if you are affiliated with an IHC hospital. The family (mom, dad and little sisters and brother) that loves Hope!